At an open seminar on 15 October 2014, Gerry Thomas (Professor of Molecular Pathology at Imperial College London) emphasized the prevalence of misconceptions related to radiological risk as well as the range of factors that can influence both dose and exposure to radiation. The seminar was co-organized by the UNU Institute for the Advanced Study of Sustainability (UNU-IAS), as part of its Fukushima Global Communication (FGC) programme, and the British Embassy Tokyo. The talk by Prof. Thomas covered a wide range of issues related to the measurement of radiological risk and the effective communication and action that can be taken to address it. She highlighted the importance of distinguishing between different forms of radiation (including natural sources) as well as the associated internal and external exposure factors associated with different isotopes. 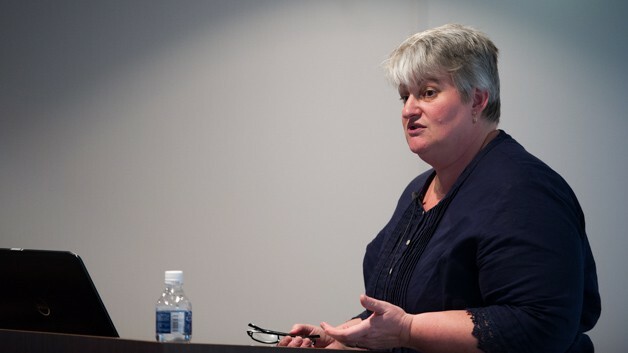 A central point of her talk was to consider the potential risks of the Fukushima nuclear accident by reflecting on past data from the Chernobyl nuclear accident and atomic bomb tests of the 1960s. Referencing recent reports from the UN Scientific Committee on the Effects of Atomic Radiation (UNSCEAR) and the World Health Organization, she emphasized that the negative health impacts directly attributable to radiation would be negligible, while those linked to psychological stresses caused by evacuation and alarming media coverage would be considerable. Opening remarks were delivered by Prof. Kazuhiko Takeuchi (Senior Vice-Rector, UNU), who outlined the difficulties associated with understanding the risks of radiation and communicating these in an understandable manner. The seminar was moderated by Dr. Christopher Hobson (Visiting Research Fellow, UNU-IAS). For more information on the FGC programme, including events, publications and video interviews, visit the FGC programme website.